Natalie & Sergio were directed to me through a great friend, Cassidy. Cassidy and I have worked together on various projects over the years, you've seen her in many images if you've gone through my portfolio and blog, and is always pushing my work and sending her friends and contacts my way, which I hugely appreciate. Natalie and Sergio are good friends with Cass so when they decided they wanted to do a maternity photoshoot before their daughter was born, Cassidy mentioned Kevin Vyse Photography. Originally we were supposed to do this shoot the weekend before, but due to a few minor medical hiccups, we pushed the shoot back a week to ensure Natalie would be good to shoot and this actually worked out better for us because the weather had a chance to turn around as well and leave us with a somewhat warm day to shoot the out door portion. We had two parts to this session: 1) Indoors at Natalie & Sergio's, where we would use an empty room that they were renovating to be their bedroom, which was perfect because there wasn't anything in it but a white couch and a dark grey-ish blue Shiplap accent wall which was perfect, gave some texture to the images. We started out doing some clean shots of Natalie using the windows in the room and it's beautiful light, did a couple of her alone then some with sergio in them as well.. and a few with both of them on the couch as well. 2) We moved outdoors to a nice spot in London near the river that had some wooded area's and some walking paths. We utilized the woods and the edge of the water bank to create some original shots. You might have noticed that in the title of this blog I said "Fairy Tale Shoot " .. well.. thats where this came into effect. 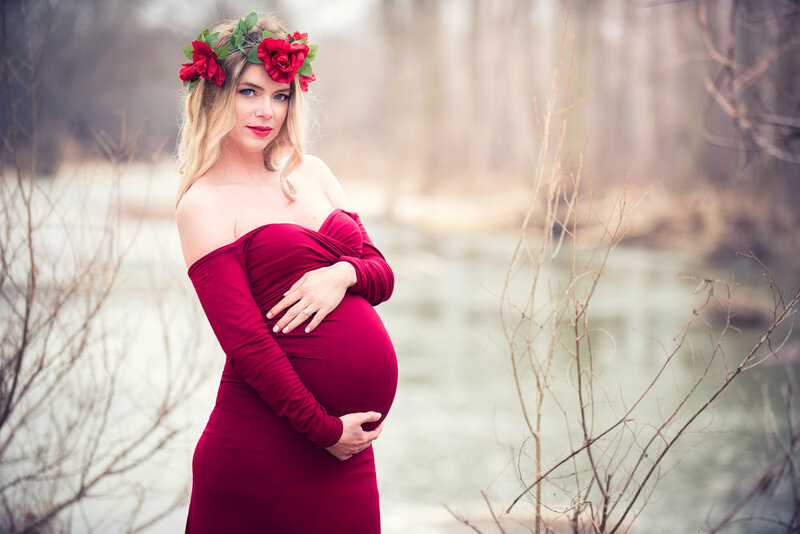 While we were out in the woods getting ready to start shooting, I had this vision pop into my head when I saw Natalie standing there in her vibrant red maternity dress and flower crown up against the earthy tones of the woods. This vision was a new take on an old fairy tale... Little Red Riding hood.. but now, Red Riding Hood is all grown up, still out in the woods, in love and pregnant with her first child. The weather was a bit gloomy, grey sky very soft filtered light, and since it was the beginning of April, it was still chilly and there were not leaves on the trees, rainy .. it's spring.. so instead of trying to fight the elements and make these images look all light and sunny, I decided to work with them and not against. Natalie and her baby were the "life" in the shots.. the woods were dark and earthy.. no real life to them yet as spring is the birth of life ... so we used this to create the images. Some of the images were all natural ambient light to keep the balance of the light even, kind of working Natalie into the woods. Once we had the ambient shots finished up, I wanted to really play up this idea of Natalie and the baby as the "life" in the images... so I broke out the Octabox and speedlights focusing the light onto Natalie and her baby bump letting the light fall off and making the background darker allowing her to be the focus of the image. Using this lighting style not only allows Natalie to stand out in the image but it also helps with that Fairy Tale kind of look.. almost like a painting with some editing, giving it a different look and feel to the viewer. Over all, this shoot was a success, I had a great time photographing these two, they were so welcoming, laid-back and fun.. Natalie had a great time "This is so much fun " she said. Pictures have been delivered and I'm so happy to have more happy clients. I'd like to thank them for choosing Kevin Vyse Photography, it was a pleasure!